Bord Na Móna Growise Peat Free Multipurpose Compost is not suitable for ericaceous plants such as rhododendrons, azaleas and camellias. For this group of plants you should use Bord na Móna Ericaceous Compost. Bord na Móna Growise Peat Free Multipurpose Compost contains all the nutrients your plants need for the first 5-6 weeks in their new setting. From then on, feed them every 7–14 days with a suitable fertiliser. Bord na Móna Growise Peat Free Multipurpose Compost is based on high quality sustainable ingredients mixed with all the essential plant nutrients to ensure healthy and vigorous plants at all stages of growth and under a variety of growing conditions. 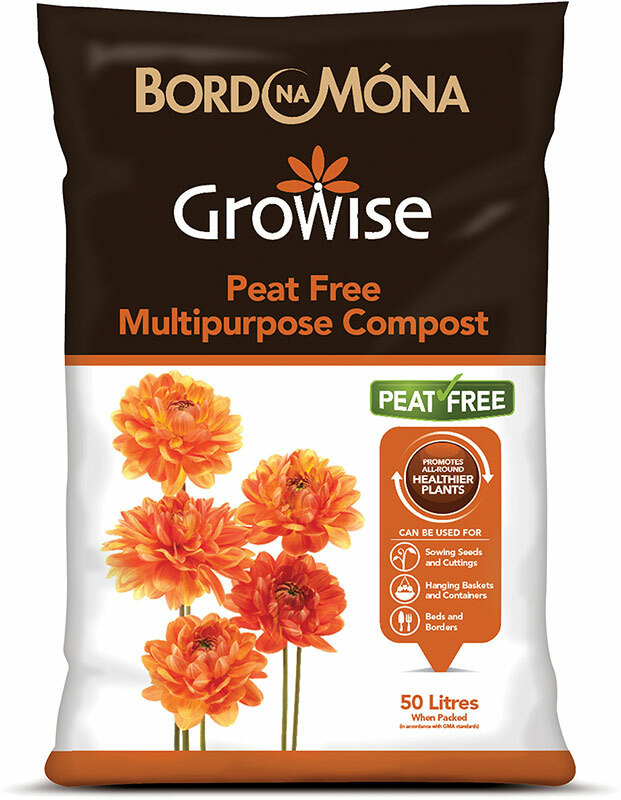 Bord na Móna Growise Peat Free Multipurpose Compost is ideal for use with both indoor and outdoor plants. It is recommended for sowing seeds, rooting cuttings and filling pots, hanging baskets and tubs. Always use the compost straight from the bag and do not mix it with other materials before use.